Hi there, hope you had a beautiful Holiday. 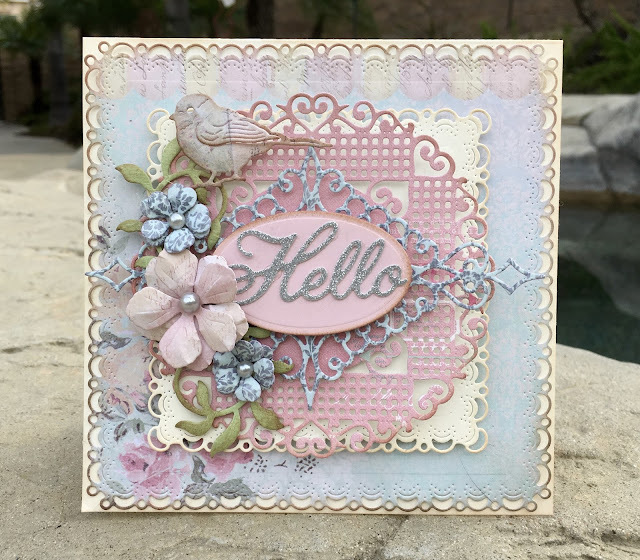 I am here todaywith a quick Hello card. 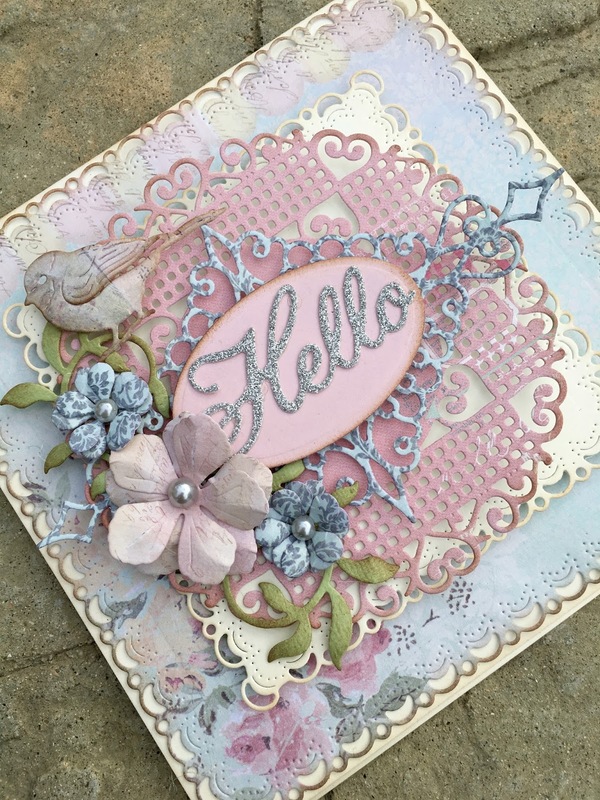 This week our challenge is Anything goes, so I created a Hello card. To start my card I cut a 5.5" square card base out of a cream color card stock. Than I die cut the largest Horizon Square Boutique Stacker Frames out of patterned paper and a smaller Horizon Square Boutique Stacker Frames out of cream color card stock to layer on the card front. Next I die cut a Lords and Commons Circle Doily out of patterned paper and a Tags #1 also out of a patterned paper to layer on top of each other and die cut an Oval out of pink card stock to layer on the Tag die. Next I die cut the larger Hello out of silver glitter card stock to lay on top of the oval as my center piece. Next I started working on the floral pieces. I die cut Judy's Blooms and Medium Rose using patterned paper and built my flowers. I glued them together and added half pearl in the middle of them. I also die cut two smaller Leafy Flourish dies out of green card stock and added them to my flowers and finally I die cut one of the birds from the Feathered Friends die to add to my card. Thanks for stopping by and hope to see your creations in this week's challenge.